Karen Burns-Booth adds a twist to a classic dinner of steak and chips by marinating the beef in a tangy Brazilian sauce to add extra flavour, and opting for tender, orange sweet potatoes for the wedges. This easy steak recipe is incredibly quick to prepare and therefore perfect for enjoying with family and friends for an al fresco dinner or summer barbecue. 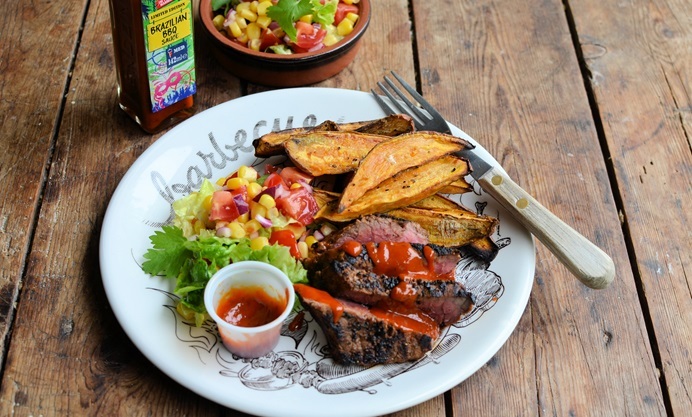 It’s nearly barbecue time and what better way to kick-start the season than with an easy recipe for Brazilian beef with sweet potato wedges; this recipe takes full advantage of the easy marinade sauce, and the salad offers up a tasty blend of tomatoes, herbs and spices. The beef is marinated in the sauce for a few hours before being cooked, either over coals or in a heavy-based griddle pan. The succulent steaks are then served with crispy sweet potato wedges and a side salad for a truly delicious 'al fresco' family meal. This recipe is super easy to prepare, and you can choose any beef steak according to your personal preference, although I have suggested a thick pavé de boeuf, rib-eye or a nice juicy rump steak. Just pop the steak into the marinade overnight or a few hours before you intend to cook it, to let the flavours permeate the meat. You can also pre-prepare the sweet potato wedges too, no need to peel the potatoes, just cut them into chunky wedges, pop them in a bag with a tablespoon of oil and seasoning, and set them to one side until cooking. The sweet, spicy and tangy flavours of the sauce make for a brilliant dip once the beef and potatoes are served too. A crisp seasonal salad goes wonderfully with this meal, and for an extra Brazilian flavour, you can add lime juice to the salad dressing. Just one tip, make sure the beef and potatoes are at room temperature before you start to cook them.